I have already posted here about the unsafely of keeping your vegetable oil in plastic bottles. 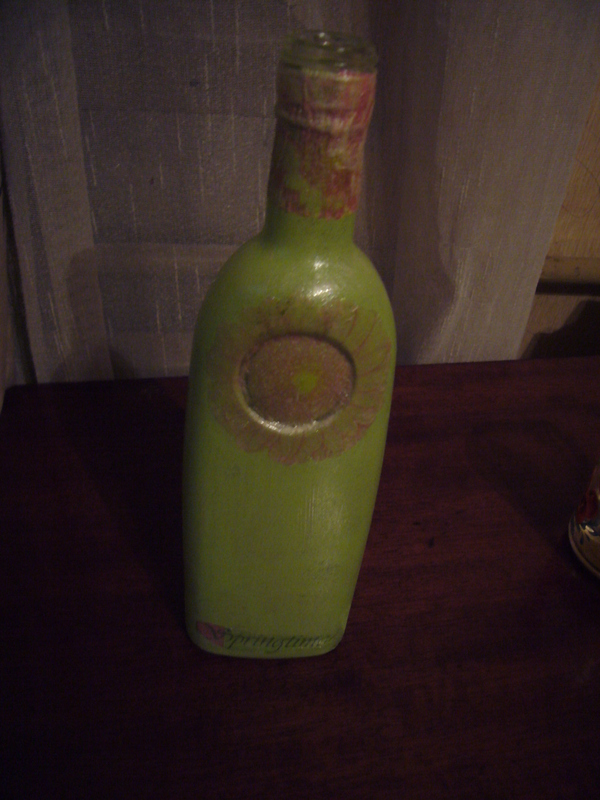 Here is another decoupage how to on decorating a glass bottle for storing your vegetable oil. The first step is to clean the bottle well. I washed it and left it to dry up. 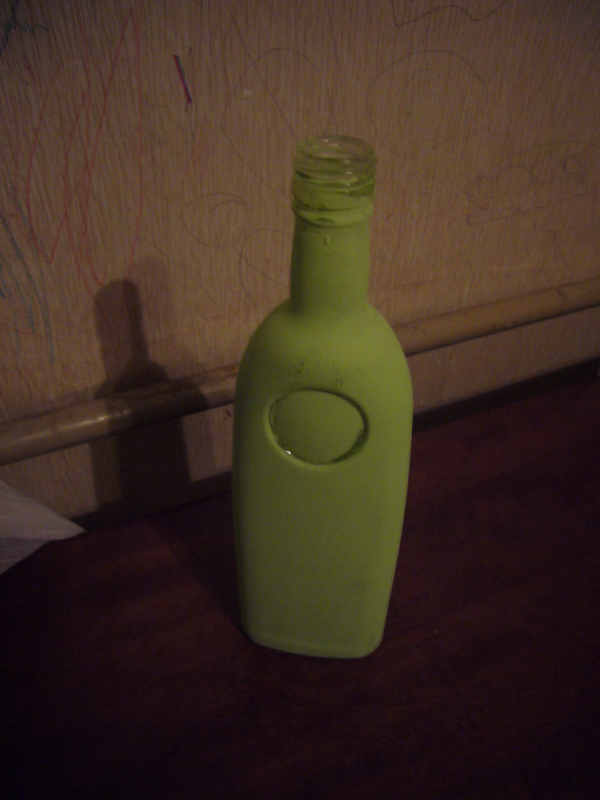 The next step on our decoupage how to is to paint the bottle. I used white acrylic paint and a green dye for it. I also used roller to apply the pain. I applied it twice. Then I got a flower napkin. A little tip here: instead of cutting out the flower pattern of the napking, I used my fingers to tear it off. This makes the flowers look more natural, when you apply them to the bottle. This way you decoupage looks more like a painting. I applied the napkin to the bottle using transparent polish. First, I applied a thin layer of it onto the bottle, got the flower stuck to it. And, used more polished to get it applied to the bottle. When the first polish layer dried up, I covered up the entire bottle with the polish. 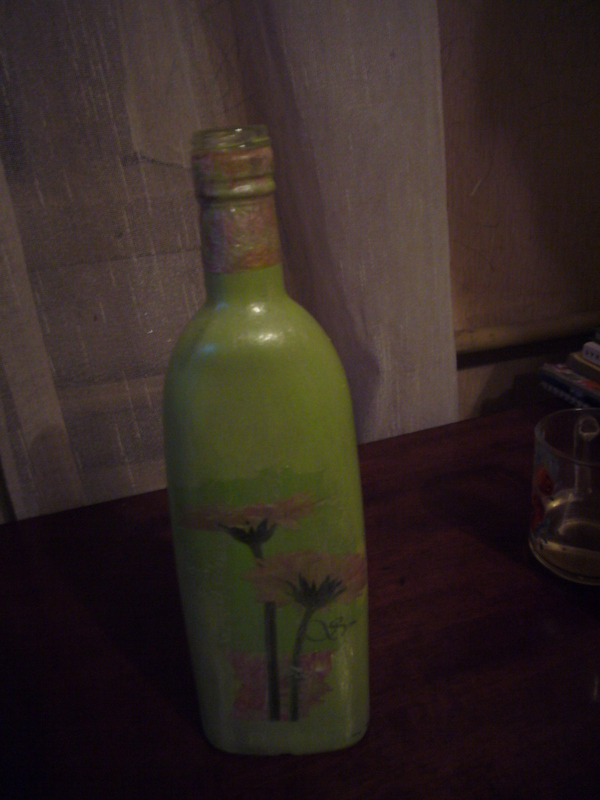 This is my easy decoupage how to for a glass bottle. This entry was posted in Uncategorized and tagged crafts, creative ideas, creativity, decoupage, decoupage how to, glass bottle decoupage, glass bottle decoupage how to, handmade, home decor, home decorations, napkins, venetable oil bottle. Bookmark the permalink.